During the American Civil War, fifteen members of the McCook family fought for the Union. Although scholars disagree on the exact number of McCooks who fought in the Civil War, it appears that Daniel McCook and eight of his nine sons took up arms for the North, as did his brother, John McCook, and his five sons. Individually, the two families were known as the Tribe of Dan and the Tribe of John. Together, they came to be referred to as the "Fighting McCooks". Daniel McCook, the patriarch of the Tribe of Dan, lived in Carrolton, Ohio, before the Civil War. He received a commission as major and lost his life in the Battle of Buffington Island in 1863. 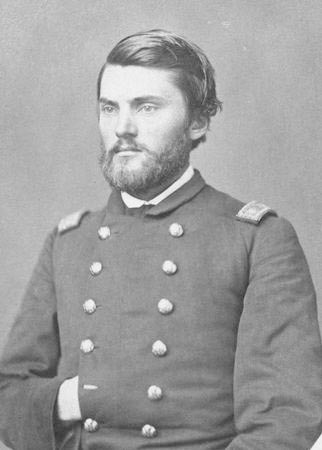 George McCook, Dan's son, was a brigadier general and served as an Ohio attorney general before the Civil War. Other members of the Tribe of Dan included Latimer, Robert, Alexander, Daniel, Jr., Edwin Stanton, Charles Morris, and John James. Latimer attained the rank of major. Confederate guerrillas murdered him while he lay wounded in the back of an ambulance in Tennessee during 1862. Robert rose to the rank of brigadier general and also died in Tennessee. Alexander became a major general and survived the war. Edwin also was a major general. Although wounded severely three times in the conflict, Edwin survived the war. He eventually became the governor of the North Dakota Territory and was assassinated. Daniel McCook became a brigadier general and was killed in 1864 at the Battle of Kennesaw Mountain. Charles Morris was the first McCook killed in the war, dying from wounds he received at the First Battle of Bull Run. John James survived the war with the rank of colonel. The Tribe of John included the family patriarch, John McCook. A doctor in Steubenville before the war, he served as a volunteer surgeon during the Civil War. Other members of the Tribe of John included Edward, Anson, Henry, John James, and Roderick. All members of the Tribe of John survived the Civil War. Edward and Anson were major generals. Henry and John James were lieutenants and served as chaplains in the Union Army. Roderick became a commander in the United States Navy. Fourteen of the McCooks became officers. Four of them died in service to their country. The Fighting McCooks' dedication to the Union war effort made them well known in the Union. Whalen, Charles, and Barbara Whalen. The Fighting McCooks: America's Famous Fighting Family. Bethesda, MD: Westmoreland Press, 2006.